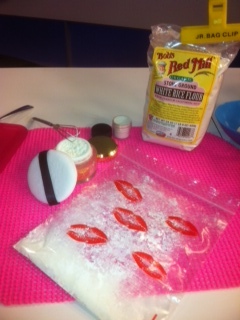 Home-made Body Powder for steamy hot weather! Havin’ a heat wave a tropical heatwave? Yes, we are all over the country. Mix the two with a hand whisk. Add a dash of lemon zest. Close lid and leave a few days in a tightly closed jar. Don’t want it scented…skip this step. Or use a drop of your fav’ essential therapy oil. Pour powder into a pretty jar. Apply with a fluffy BODY powder brush or powder puff. ENJOY!